What is the importance of the Holy Spirit being on Simeon as he speaks? What words does Simeon use to describe Jesus? What does Simeon say Jesus will cause? And why? How do you think Mary felt when Simeon said, “a sword will pierce your own soul too”? 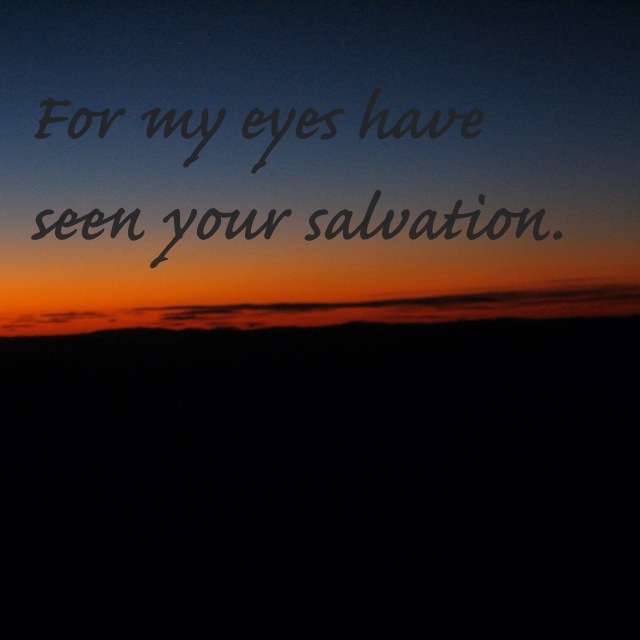 Father, where would I be without your salvation? Thank you that you keep your promises! Thank you, Lord, for extending your saving grace to all the nations, to me. Thank you for the moment I realized your light was for me, would overcome the darkness, and would satisfy the deep longing of my soul. I pray, Father, that the thoughts of my heart would be of you and that they reveal my faith in and devotion to you. Where my thoughts wander, God, I pray that you would forgive me quickly and redirect them so that my eyes and heart are fixed on you and my words and actions reflect your love and grace. Purification rites would have been required 40 days after Jesus’ birth. Consecrate means to set apart for God’s use. What do you imagine the conversations between Mary and Joseph were like just after Jesus was born? A week later? A month later? Knowing what they had been told about their baby, do you think Mary and Joseph had any hesitation about presenting Jesus at the temple? 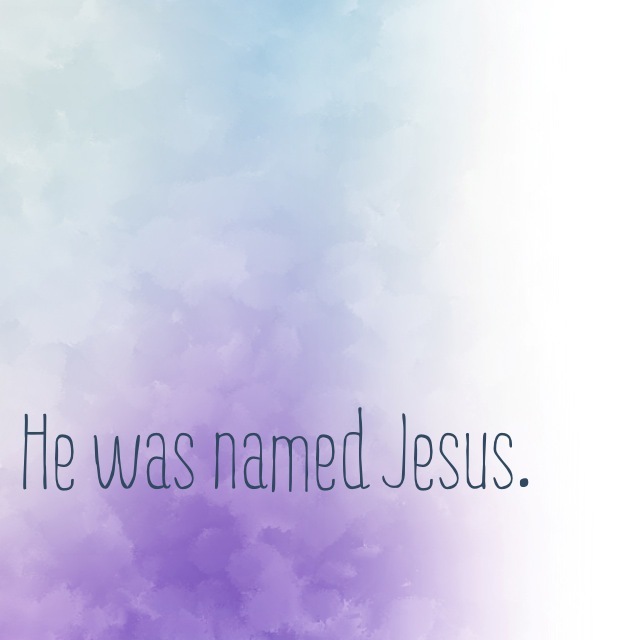 Is any emotion evoked in you when you speak the name, “Jesus”? Describe it. How do you feel when you hear someone use the name of Jesus in anger or frustration? Jesus, my Lord. Your name evokes in me a love beyond compare. Forgive me the times your name has escaped my mouth as a curse or out of anger or frustration. My heart breaks to know how this grieves you. When I hear your name, I see eyes that penetrate my soul and cried for me, arms spread wide enough to encompass even me, a body beaten and broken for me, and a mouth that knows my name. 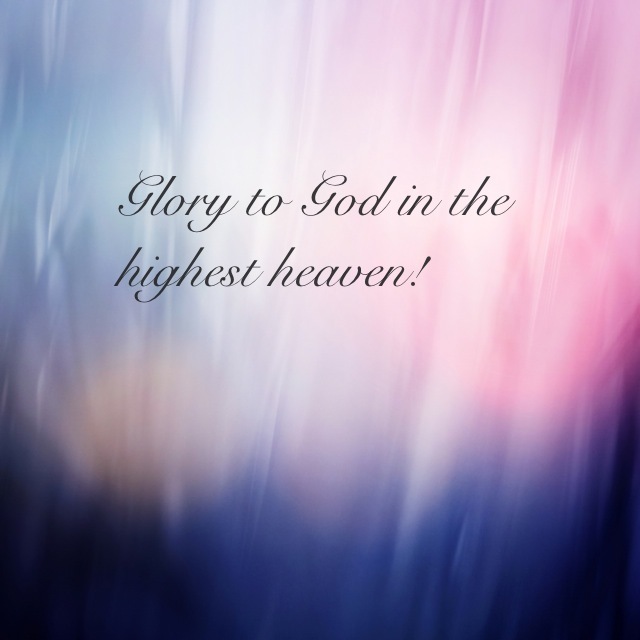 But Lord, I also see a glorious and fierce light, a strong arm that pulls me up, and an ocean of grace. Jesus. Lord Jesus. What was Herod afraid of with the appearance of this new king of the Jews? 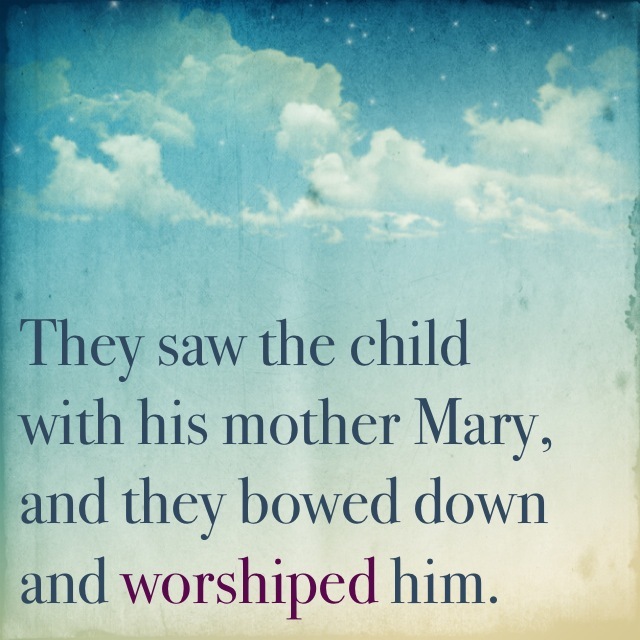 What do you think it would have been like for Mary and Joseph for these men to have come, bow down, and worship their new son? Have you ever been afraid of what God might ask you to do if you listened carefully? Why? What are you afraid of? Father, how is it that I forget that I am the created and you are the Creator? How is it that I constantly seek to wrest control away from you, turn my way, ignore you, ask you to wait outside, deny you? Am I no better than King Herod? You see the broken places in me, Lord. Hold me fast, lock your hand on mine. I am apt, over and over, to let go. I have not always given you my best gifts, but offered instead the leftovers. Help me to be what you made me to be, to follow you fearlessly. Help me to worship you in each moment of my life and use my remaining breath to make you known, glorify you, and forward your purposes. 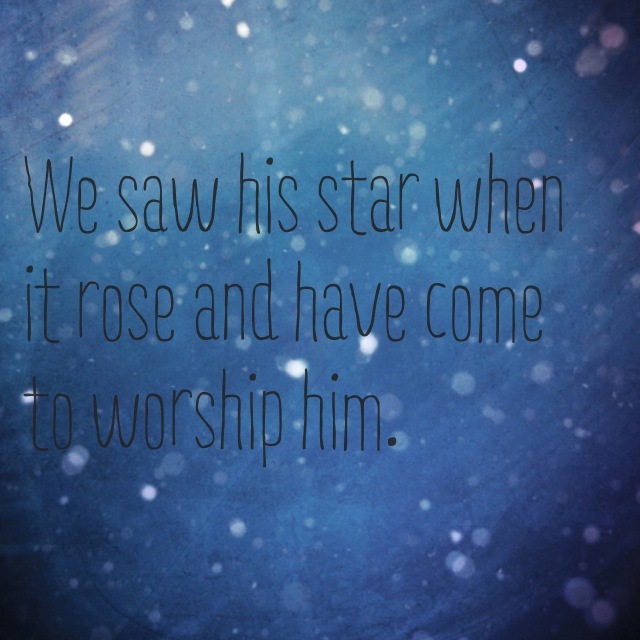 How do you think the shepherds explained what they had been told about the newborn child? Have you ever overheard people saying good things about your parent, or child, or spouse, or friend? How did it make you feel? Think of a time you experienced something – a beautiful sunset, a feeling, words from someone else, an unexplained mercy – that you could not quite put into words for another person. Have you been able to treasure and ponder that experience? How? Father, when I read what happened, and imagine the way the shepherds must have explained to their friends, their family, and even strangers, about the arrival of the Savior, I am amazed! 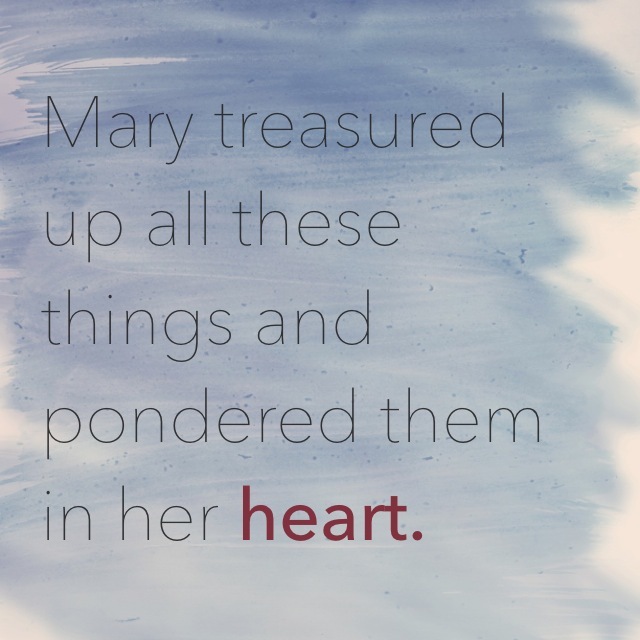 When I think of what Mary must have felt as she heard people describing what her son was, what he would be, and all he would do! How is it that I could ever come to see this event as run-of-the-mill, boring, or just another story? Help it sink in, Lord! Block out all the other noise and distractions that pull at me. Thank you for the blessings and mercies you have given to my heart alone. When you bless me this way, Lord, I pray that I will treasure it deeply.